I love this one. Peter writes an excellent example of what Zero Out of Five is all about; if you do not know the answer, make it up. I find it interesting that Peter decided to make up something rather than write about someone real. This is remeniscent of 2 Girls, 1 Cup, 0 Marks. I love how Peter talks about the "President of Japan" and how later in the essay he mistakingly (or on purpose) refers to Japan as China. 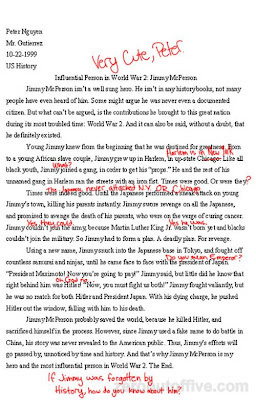 I love the marker's comment when Peter writes that Hitler was right behind "Jimmy McPerson". "If Jimmy was forgotten by History, how do you know about him?" that's a classic comment.